Hello Dealsnloot Readers,Now Freecharge is Offering 100% Cashback on any McDonald’s Burger (Max Rs 185).Do you love McDonald's Burger? So here i am back with loot offer for all users. Freecharge is presenting amazing offer on McDonald's Burger. This is the loot offer. 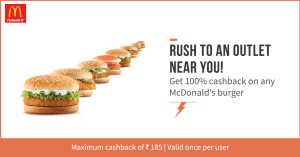 Freecharge is offering Flat 100% Cashback on McDonald's Burger. That means you will get Burger absolutely free. Just pay the Burger amount via Freecharge wallet and you will get full 100% cashback in your Freecharge wallet.So Hurry ! Grab This Loot Deal and Get Free Burger Loot By Freecharge at MACD. Load money in your FreeCharge Wallet. Visit your Near McDonald's outlet. Click on Pay Merchant to generate your #OnTheGo Pin. Enter your Mobile number & OnTheGo Pin on the EDC machine/Card swipe machine. Pay the amount via Freecharge wallet. Finally you will get full 100% cashback in your account. Enjoy the cashback in your FreeCharge balance. Get 100% Cashback on any Burger when you pay with FreeCharge at McDonald’s Outlets in West & South India only.